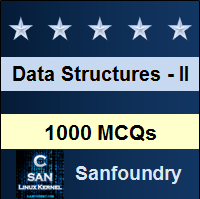 This set of Data Structure Multiple Choice Questions & Answers (MCQs) focuses on “Edit Distance Problem”. 1. Which of the following methods can be used to solve the edit distance problem? Explanation: Both dynamic programming and recursion can be used to solve the edit distance problem. 2. The edit distance satisfies the axioms of a metric when the costs are non-negative. Explanation: d(s,s) = 0, since each string can be transformed into itself without any change. d(s1, s2) > 0 when s1 != s2, since the transformation would require at least one operation. Thus, the edit distance satisfies the axioms of a metric. 3. Which of the following is an application of the edit distance problem? Explanation: All of the mentioned are the applications of the edit distance problem. 4. In which of the following cases will the edit distance between two strings be zero? Explanation: The edit distance will be zero only when the two strings are equal. 5. Suppose each edit (insert, delete, replace) has a cost of one. Then, the maximum edit distance cost between the two strings is equal to the length of the larger string. Explanation: Consider the strings “abcd” and “efghi”. The string “efghi” can be converted to “abcd” by deleting “i” and converting “efgh” to “abcd”. The cost of transformation is 5, which is equal to the length of the larger string. 6. Consider the strings “monday” and “tuesday”. What is the edit distance between the two strings? Explanation: “monday” can be converted to “tuesday” by replacing “m” with “t”, “o” with “u”, “n” with “e” and inserting “s” at the appropriate position. So, the edit distance is 4. 7. Consider the two strings “”(empty string) and “abcd”. What is the edit distance between the two strings? Explanation: The empty string can be transformed into “abcd” by inserting “a”, “b”, “c” and “d” at appropriate positions. Thus, the edit distance is 4. Which of the following lines should be added to complete the above code? Explanation: The line arr[i][j] = min completes the above code. 9. What is the time complexity of the above dynamic programming implementation of the edit distance problem where “m” and “n” are the lengths of two strings? Explanation: The time complexity of the above dynamic programming implementation of the edit distance problem is O(mn). 10. What is the space complexity of the above dynamic programming implementation of the edit distance problem where “m” and “n” are the lengths of the two strings? Explanation: The space complexity of the above dynamic programming implementation of the edit distance problem is O(mn). Explanation: The program prints the edit distance between the strings “abcd” and “defg”, which is 4. 12. What is the value stored in arr when the following code is executed? Explanation: The value stored in arr when the above code is executed is 2. Explanation: The code prints the edit distance between the two strings, which is 1.